Michelle Brown is the co-owner and co-founder of Teaism, a set of Washington, D.C. teahouse-restaurants operating since 1996. 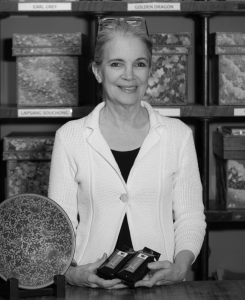 Michelle has worked in the food and beverage industry for 40+ years. She has a broad range of experience opening and running restaurants, and many aspects of her life led her down the path of tea. Major factors include her time working for Restaurant Nora and developing Asia Nora’s tea program, which ignited her passion for tea and sustainably sourced foods, and launched her towards opening Teaism. Over the years she has acted as a support and sounding board for other women entrepreneurs. When not at work, Michelle is active within the DC cycling community.